Updated waterproof duck boot with front zipper for an easy on and off. Ornamental lace design. 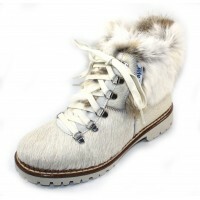 Stay warm to -22 (F) degrees with fur-like linings. Rubber grip sole. Updated waterproof duck boot with front zipper for an easy on and off. Ornamental lace design. Sta..